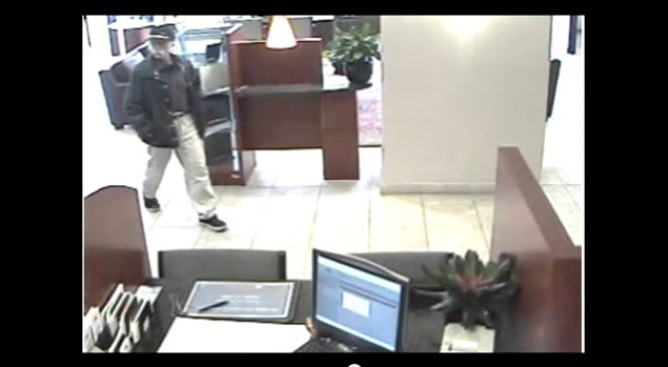 FBI and San Mateo police are looking for this alleged bank robber. The FBI and police are asking for help identifying an older man with a white mustache and cap who allegedly robbed a bank Monday afternoon in San Mateo with a threatening letter, according to the San Mateo Police Department. Police said a man robbed a bank in the 800 block of South El Camino Real at about 12 p.m. The man handed a teller a threatening letter and walked out of the bank with an undisclosed sum of money, according to police. Police released some surveillance video on YouTube. Police said the man did not display a weapon or make any threatening statements or gestures. Officers searched the area when they arrived at the bank, but did not find the man. Police are describing the robber as a white man in his late 60s with a thin build and about 5 feet 6 inches to 5 feet 8 inches tall. He also has a white mustache. The suspect has bushy white hair, a white mustache and glasses. Anyone with information about the robbery is being asked to call Detective Nick Ryan at (650) 522-7670 or the San Mateo Police Department's Secret Witness Line at (650) 522-7676. Anonymous tips can be made online at http://tinyurl.com/SMPDTips.